It’s been almost 12 years since I last visited the San Diego Comic-Con. I attended the con 5 times before the 21st century, and it was my first major eye-opener to the world of comic creators, panel discussions, and much more. I keep saying that one of these days I’ll go back, but after hearing how big the convention has grown (not to mention the masses staying in line for days to get in to certain panels! ), I wonder if I dare to. Even so, this year’s convention fueled a memory of one of my favorite experiences there. In February of 1998, my first (official) introduction to the world of Japanese anime and manga came when I checked out Urusei Yatsura Movie 2: Beautiful Dreamer from a local video store. It served as my gateway to the works of manga creator Rumiko Takahashi, and within the span of a year, I had gotten into her other major series, such as Maison Ikkoku, and Ranma 1/2. The first collected volumes of Rumiko Takahshi’s works from the 1980’s (from left to right): Urusei Yatsura, Maison Ikkoku, & Ranma 1/2. I really grew to love Takahashi’s art style, and was one of the few that spoke up about their love for her first major work, Urusei Yatsura. At the time I had discovered Urusei, Viz Communications had begun to cancel the manga series, due to low sales (believe me, it was too weird for the majority of American audiences, but not for me!). Not wishing to be denied over 60 % of the series’ stories, I soon after started up a small fan-translating group online called Project ILM: Industrial Lum & Manga (much like the series relied on puns, so did I for my group’s name). Made up largely of a volunteer squad of dedicated fans, we succeeded in translating and compositing the remaining stories of Urusei Yatsura by 2003. The Project’s site has come down since then, but our translated stories are still floating around out there (you’ll find several with my name listed as a compositor). In the Spring of 2000, an article in a far corner of the internet announced that Rumiko Takahashi would be making her 2nd stateside appearance that summer at Comic-Con (she had last appeared there in 1994). This appearance would entail both a discussion panel, and an autograph session! The year 2000 was the first time I spent 4 days at the con, and in the end, it was good that I came prepared. Once I arrived that Thursday (July 20, 2000), I was informed that there was a 350-person limit to the autograph sessions (200 set for Saturday, and 150 for Sunday). I spoke with a couple fans who were also reading the fine print, and it seemed that this was to prevent what happened in 1994. Apparently, autograph tickets were available on a first-come/first-serve basis at that show, and the majority of them were scooped up by sellers on the floor, who then took some of their wares to Takahashi, and then marked up the signed items for bigger sales later on. On Friday (July 21, 2000), as soon as we got past the entrance, I made my way down towards the Viz Communications booth, and got my ticket. At their booth, a representative for Viz made the announcement that there would be 4 drawings on Friday (for the Saturday autograph session), and 3 drawings on Saturday (for the Sunday session). Also interspersed within the autograph tickets, were several ‘gold’ passes, that would not only get you an autograph, but a personal sketch drawn by Takahashi herself! When the time came for the drawings, many of us crowded around the booth’s limited floor space. The next day (July 22, 2000), I came armed with Volume 15 of Urusei Yatsura, and made my way up to the ‘Sail Area’ on the convention center’s roof. The wait in line was definitely a lot of fun for us Takahashi fans. There were some people who had brought animation cels for Takahashi to sign, and one person even dressed up as Genma Saotome in Panda Bear form! I was also fortunate enough to meet another fan of Urusei Yatsura, who had also brought Volume 15 of the collected manga with him as well! Eventually, I made it to the head of the line. I stammered out some praise towards Takahashi-sensei, and eagerly handed Vol 15 over to Toshi Yoshida, one of Viz’s translators. However, there arose a question: where should Takahashi sign? 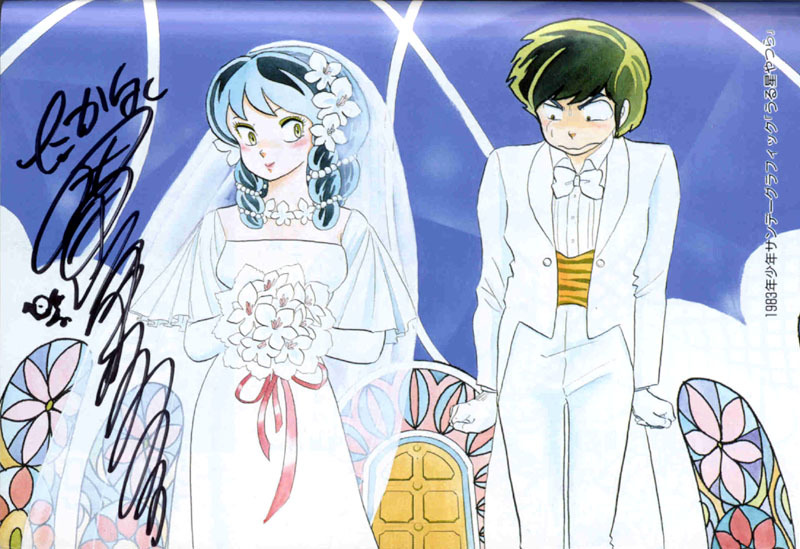 Eventually, I chose for her to sign her name on the first page, which featured a watercolor/ink print of the main characters Lum, and Ataru Moroboshi, in wedding attire. Below, you can see a scan of the image along with Rumiko’s signature. One fun addition that Takahashi made, was a tiny little image of the piglet P-Chan, from Ranma 1/2 (you can see him just to the left of her signature!). I caught up later on with the guy who also had the same volume as I did. Not only did he also choose the same place for Takahashi to sign, but she drew a little Piyo-Piyo chick from her series Maison Ikkoku for him. After the autograph session, the next event that many of the fans were awaiting, was a question and answer panel in Rooms 6A/B. I endured discussion panels by Kevin Smith and then the gang of Futurama, before it was time for Takahashi. I actually came prepared to record the session, and previously had 90% of the panel discussion posted on the internet back in 2000 (transcribed, of course). We were also treated to some newly- dubbed episodes of Ranma 1/2, and the first animated preview for the soon-to-be-released Inu-Yasha television series (based on Takahashi’s recently-released manga title). There were some predictable questions (“What does Maison Ikkoku’s Mr Yotsuya do for a living anyways?”), and even a couple that debunked some rumors (“I heard that Lum was a nickname of yours. Is that true?”). The discussion panel lasted for 1 hour and 45 minutes, before Takahashi gave a graceful thank you and left the stage. Since those few days at Comic-Con, I’ve looked all over the internet, but never found anyone else who had chronicled this appearance by Takahashi. It seems this may have been her last US visit, as I have been unable to find information about any appearances since then (whether in San Diego, or other major American cities). Because of that, I feel kind of special that I could post this information. I originally had a small page on Geocities dedicated to the event, and it’s supposedly still out there in cyberspace, along with my transcript of the discussion panel. I’d love to post it up somewhere, but am not sure where. I’m sure several fans would love to read some of those questions and answers from that July day. One of those Comic-Con moments I can never forget. That’s me on the right (slimmer and geekier), along with another Takahashi fan who had the same volume 15 of Urusei Yatsura (albeit from a different print run)! To this day, I still regret not knowing who this guy was. The wonderful thing about the traveling film festival Castles in the Sky: Miyazaki, Takahata & the Masters of Studio Ghibli, is its ability to not only expose larger groups of people to many unknown gems of Japanese animation, but also showcase several films from the studio that have never been released in the United States. One of those films, is titled Ocean Waves. Originally titled as Umi ga kikoeru (which in Japanese means I Can Hear the Sea), it starts out with a young man named Taku, who is seen taking a plane from Tokyo, to Kochi (a smaller city in Southern Japan). As the plane takes off, he begins to reminisce (and narrate) about two people from his years in Junior High and High School. The first is a young man with glasses named Yutaka Matsuno. After their Junior High class trip was cancelled due to low test scores, Taku and Yutaka are the only two students to question this decision. This is the beginning of their friendship, that carries on over into High School. In high school, a new student transfers from Tokyo, named Rikako. Rikako soon becomes a “beautiful girl of mystery” among the male students, and it seems to Taku that Yutaka has a crush on her. However, Rikako truly seems an enigma. While she excels highly in school studies, she rarely speaks to any of the other girls, or participates in group activities. From there, Ocean Waves weaves a story that some may have thought would be predictable (two best friends + new girl = awkward love triangle), but the film manages to shy away from many conventions regarding this sort of thing. What follows as Taku continues to narrate the story, becomes something that almost has to be seen to be believed. Once the film was over, I immediately flashed to another unseen Ghibli film, Only Yesterday. Both stories carry through with the lead protagonist taking a trip that leads to reminiscences of the past. However, out of both of these films Yesterday is by far the strongest. That’s not to say that Ocean is a bad movie (I’ve never seen a ‘bad’ Ghibli-produced film), but this film doesn’t soar to the heights of such masterpieces as Spirited Away and Grave of the Fireflies. Some might think of Ocean Waves the way some PIXAR fans think of films like Cars and A Bug’s Life: Good, but not great. (note: This is one reason why Ocean Waves did not earn a slot in my blog category, Great Films You’ve Never Seen). Art-wise, the film doesn’t falter in the visuals we’ve come to know from Ghibli. The artists do a great job rendering the cityscapes of Tokyo, and even the lesser-seen city of Kochi. Prevalent in numerous shots of Kochi is its landmark castle, which seems to tower over everything. When I saw Only Yesterday, I was intrigued by how the character designs differed from Hayao Miyazaki’s depiction of human adults. Here, the characters seem more Japanese in appearance than in any of the studio’s productions I’ve seen. That may be key to how the film is depicted. Unlike other films from the studio’s catalogue, Ocean is devoid of flights-of-fancy, or dreamlike landscapes. The closest we get is a framing device, whereby a white bordered frame shows us images as if we had chanced upon a photograph. 1) It was not a theatrical release, but a made-for-television movie (hence, its running time of only 72 minutes). 2) The film predates Ghibli’s Whisper of the Heart by 2 years, and is actually the first ‘film’ not directed by Hayao Miyazaki or Isao Takahata for the company. Originally based on a novel by Saeko Himuro, Kaori Nakamura handled screenplay duties, with directorial work being done by Tomomi Mochizuki. It is notable that Mochizuki’s credits prior to Ocean Waves proves that he was very well suited for the job. He had worked on relationship-oriented anime series such as Maison Ikkoku, and Kimagure Orange Road. Aside from a few lines of dialogue from one girl about her period, there’s very little that I can see that would keep this film from being released. However, it is included under the distribution deal that Walt Disney Pictures has with Studio Ghibli, and given their penchant to now go through and re-release titles on Blu-Ray, we’ll probably get previously-released works first before we (possibly) see this film on Region 1 DVD/Blu-Ray. An Animated Dissection: Does Ratatouille contain metaphors for The Walt Disney Company? As the mid 2000’s began to roll around, a pall of uncertainty hung over fans of Pixar Animation Studios. With the company getting ready to release Cars, there was a tug-of-war going on between the studio and The Walt Disney Company, with neither side willing to budge. Luckily, Michael Eisner was ousted as Disney’s CEO, and Bob Iger came onboard. Iger became the peacemaker that was sorely needed, even if his methods were seen as shocking when the deal for Pixar amounted to a $7.4 billion acquisition. But along with keeping one of the world’s most successful studios within the folds of Disney, several of Pixar’s top players came onboard to help Disney as well. Steve Jobs became one of the biggest shareholders on the company’s board, while Ed Catmull & former Disney animator John Lasseter would oversee the then-floundering feature animation division. John would also come on board to help revive the company’s theme park division (including major input into the just-completed $1.1 billion revamp/expansion of Disney’s California Adventure in Anaheim, CA). But, I’ve gone off the track and jumped to today. Let’s backtrack to that uncertain period of time. As the Disney/Pixar deal was set to expire, one film remained in limbo regarding what would become of it: Ratatouille. Originally conceived by Jan Pinkava (director of the award-winning Pixar short, Geri’s Game), the story was revamped by Brad Bird, but held onto the concept of a rat with exquisite culinary tastes, who wants to achieve the impossible: becoming a chef. At the time, the concept being pitched for the film seemed as head-scratching to alot of people, as John Lasseter’s want of a film about talking cars. Ratatouille was a film that was probably one of the toughest for the studio to market. Probably not since The Incredibles had a Pixar film been released with such a low volume of merchandise (of which the majority was only available at The Disney Store). Even so, it became a surprise (if modest) hit in the United States, and netted Pixar its third Best Animated Feature statuette the following spring at The Academy Awards. After watching the film a few times, I couldn’t help but wonder about some of its content. The film was being made during a turbulent time between Disney and Pixar, and several points of the film seemed to reflect a bit on both of the studios. I have never really heard anyone do a comparison, so I decided to sit down and write this. The film’s famous chef Auguste Gusteau is considered to be one of the world’s premier chefs, whose creativity and skills are loved by almost everyone the world over. Gusteau seemed to encourage others to go out and achieve greatness themselves, and just by what they talk about regarding him, he did not shy away from trying things that may or may not work (we hear of such a thing in the film, when Skinner tasks Linguini to prepare the dish ‘Sweet Bread ala Gusteau,’ a recipe that was considered ‘a disaster’). This was the mantra that Walt Disney worked with through much of his life. He wanted to do things that noone else had considered or achieved. Some of his ideas achieved great success (the creation of Mickey Mouse, and the film Snow White), and others did not fare so well (such as his attempts to elevate the art form of animation with Fantasia in 1940). This could be seen as metaphorical to how many animators/artisans admired Walt Disney and his studio guys for achieving what many people said were stupid ideas (such as adding sound to film, adding color, and making a full-length ‘cartoon’ film for example). While Pixar would hold true to their love of Disney, they would also try to break new ground by doing things differently. When they were given the green light to create their own feature-length film, they wanted to go their own way. They didn’t want to ‘copy’ Disney and make a musical or a fairy tale story, or adapt a story into a feature (all of which were popularly being ‘copied’ by Disney’s competitors at the time). Instead, the guys created an original story of their own, and in their daring to be different (but still adhere to the principles of Disney storytelling and animation), crafted something that surprised almost everybody! Remy’s preparations in the kitchen that lead to new and exciting dishes could definitely be seen as comparable to what many were saying when Pixar’s films surprised many. Collette is given the task of showing Linguini what to do around the kitchen at Gusteau’s. During a portion of their tasks, she tells him how in studying Gusteau’s recipes, she noticed he often did unexpected things. This causes Linguini to begin writing down to “Always do something unexpected,” but is quickly reprimanded by Collette. This scene almost seems to speak of the stagnation of The Walt Disney Company in the wake of Walt’s death. During his lifetime, almost all major decisions were largely decided upon by Walt, and he was often known for wanting to do the unexpected. But once he was gone, the company entered into a period where the company struggled to just stay afloat. The 1970’s brought very little change or innovation. And even those who attempted to do something unexpected were often discounted, or met with disdain. The animation department continued to “follow the recipes.” There was very little that innovated. The stories often seemed ‘safe’ enough, but none really seemed to jump out and take hold of people. Of course, doing something unexpected will not guarantee one success. Walt’s grand experiment with music and animation, Fantasia, failed to find favor with audiences in 1940. The same could almost be said in 1984, when the company made an unexpected turn in storytelling, and made The Black Cauldron. However, this attempt to do something unexpected, didn’t yield results, and became a costly quagmire that almost sunk the studio’s animation division. Once Gusteau died, the business was turned over to his souse chef, Skinner. The fact that Gusteau’s ‘stalled’ with the death of its namesake, is almost reminiscent of what became of the Walt Disney Company when Walt passed away. You were stuck with a crew of people, and the guy who called the shots was now gone. There was very little direction being given, and the 1970’s and early 1980’s became ‘the dark times’ for the studio. Almost none of their live-action efforts succeeded in being as magical as films like 20,000 Leagues Under the Sea or Mary Poppins. Plus, the animation division at Disney kept getting hacked to ribbons until it soon numbered under 100 people. There were those who yearned to do what had once made the studio great, but at that time, it looked like the time for reawakening was gone for good. The merchandising of the studio’s properties really began to kick into overdrive with the studio’s second animation renaissance in the 1990’s, and has been on a meteoric rise ever since, with one example being the billion-dollar Princess line. Many have incited Disney for seeming to slap their name and their familiar characters on everything, from apple slices to credit cards. Of course, not all products are great. The name can often be slapped on things that seem very uncharacteristic to how people see the company, and over the years, many have been upset at the tarnishing of the brand name used for quick profit. For myself, the Disney name slapped on direct-to-video sequels like Cinderella II (a title that makes me shudder even now) definitely had an impact on how I perceived their operations at the time. Once it is found out that Linguini is Gusteau’s heir, the company’s holdings are turned over to him. One of the biggest changes he makes, is the cancellation of the frozen foods line that Skinner had been working on. 1) The dismantling of Circle 7 Animation, allowing that the creation of any sequels/prequels to Pixar films, were to be created and decided upon by Pixar themselves. 2) The dismantling of the direct-to-video sequel productions that had been such a big money maker for over a decade. While executives at Disney may have cried foul that profits were being sacrificed, the new management painted a different picture for them: a return to quality, which was eagerly welcomed by many (including several of the company’s shareholders). This is one of those comparisons that could be stretching things, but just remember, this article is largely my mind making comparisons. While Steve Jobs doesn’t quite have the reputation of Anton Ego (nicknamed ‘The Grim Eater’), both are men who are very picky when it comes to quality and presentation. Both men will settle for nothing less than perfection. At the end of the film, Gusteau’s is shut down once Skinner and a health inspector report that there were rats in the restaurant’s kitchen. However, where one door closes, another opens. Anton Ego ends up becoming a business partner when Linguini and Collette choose to open a small bistro, named La Ratatouille. Here, Remy can continue to cook and create new dishes, satisfying his needs, and carrying on the traditions of Auguste Gusteau. One could almost fold the Anton Ego/Steve Jobs comparison into this one. Both men were sold off on a concept, and put down money to invest in a business. In the case of Steve Jobs, this came about when in the early 1980’s, Pixar was a company division that was being considered for shutdown by their owner: Lucasfilm, LTD. Several of the people in the division felt there was potential to keep Pixar alive, and eventually got the attention of Steve Jobs. Jobs bought into their spirit, along with the dream that one day, Pixar could achieve the impossible, of creating the world’s first computer-animated feature film. The gamble paid off when almost a decade later, Toy Story was released into theaters. Pixar was considered by some to be ‘out-Disneying’ Disney, given that they were creating heartfelt, emotional films that were enchanting audiences, and raking in more money than Disney’s animation output. In the colony where he is part of, Remy is often the odd rat out. He often doesn’t see eye-to-eye on a number of things, and is often at odds with his father, Django. One thing they disagree on is food. Remy only wants to partake of ‘the good stuff,’ but to Django, there’s very little choice in being picky. Later on, when the family is reunited in Paris, Django grows concerned that Remy is interacting with humans, and shows him a window filled with dead rats, rat traps, and poisons. Django claims that certain rules and ways are set, and that they can’t expect change, but Remy refuses, and claims that change can be accomplished, willing to continue to put himself on the line to do something different. – he created one of the best non-Disney/non-Pixar films in 1999, with The Iron Giant, a film that became a classic shortly after it tanked at the box-office. It was Bird’s vision of an animated film about a family of superheroes that intrigued his school chum, John Lasseter, and John soon invited Brad and some of his cohorts on Iron Giant up to Pt Richmond, CA (where Pixar’s was first located outside of Lucasfilm) to develop their vision. However, being part of Pixar didn’t give Brad a free ride to do anything he wanted. At the first pitch of the idea to Disney, one executive said, “Ok Brad, there are some things you can, and can’t do in animation.” He then proceeded to rattle off a list of things, and supposedly, Brad did the best he could to control himself (note: information of this can be found on a retrospect on the Blu-Ray disc of The Incredibles). To counter this, John Lasseter explained that they were just going to ‘explore’ Brad’s concept, and soon, that ‘exploration’ turned into one of the studio’s most loved films. Of course, Brad still continues to try and shake things up. Just take 2011’s Mission Impossible: Ghost Protocol. In this film, Brad chose to not give us a generic Tom Cruise film, but shook things up in numerous ways. The IMF team are forced to go rogue, and almost none of their fancy gadgets seem to work. So what is there to rely on? Each other. Brad’s turn of making the film more about the people and less about the spectacle, almost seemed to hint at Pixar‘s own philosophy, that it’s the people working on their films that make all the difference. Aside from seeing some culinary shows talking about Auguste Gusteau, much of what Remy learns comes from Gusteau’s book, Anyone Can Cook. It’s filled with recipes, and a number of things relating to the chef and his restaurant. And, there you have it. 5 years of these comparisons percolating in my brain, and I finally got (most) of them out. I will admit this is not the only film that seems to spout some metaphors to The Walt Disney Company. Blue Sky Studios‘ 2004 film Robots also contains some comparisons as well, and I may just do an article on them for a future Animated Dissection. Looking back on the older days of my action-figure collecting, 2002 stands out in my mind. Up until this point, I was still collecting Star Wars figures, just not at the rate I had done in the era when The Phantom Menace came out. The line after this, Power of the Jedi, lasted only a few years, and some of my money went there, as the line encompassed figures from Episodes I, IV, V, & VI. After many of the figures in the original 1995 release had action-stances, Kenner‘s releases afterwards made them more basic in posture. With Attack of the Clones, many characters soon were locked into wide-legged action stances, which often kept them from fitting into some of the vehicles that were offered. One example is Padme Amidala, whose stance made her more statue than action figure. It sounded like a cool idea at the time: put magnets in some Jedi’s hands, and give them metal-hilted lightsabers. However, the magnet concept soon stretched to other areas. It was what allowed Obi-Wan to hang onto an assassin droid, or allowed Anakin to ‘Force-flip’ open a crate. Even so, the magnets often couldn’t be hidden, and left Obi-Wan with a magnetic disc ‘implanted’ in his right hand. Several figures had these, including the ‘Hanger Duel’ Anakin, who had a wheel on his back that when rotated, caused his hand to spin. A couple like Count Dooku and Mace Windu, had a rotating upper-torso feature that occurred when you squeezed their legs. There were also clear-plastic items that would click into place for release for action, from force-blasts for the Jedi, to a fireball for one of Jango Fett’s figures. There were also figures like the Super Battledroid that ‘exploded’ at the push of a button. One has to wonder where the decision to add more action to the figures came from. One of the major upgrades that was touted regarding the line, was that the sculpts of the character’s heads were taken from 3D scanning data, to make them seem more accurate to the actor’s appearance (which explains such draw-dropping accuracy as this sculpt of Mace Windu). Even an action figure of Sam Jackson can’t be normal. In the end, it does seem odd that I’d find something wrong with Hasbro giving these action figures ‘action features,’ but it really seemed like they did take a big step backwards. Attack of the Clones would be folded into the Saga Legends releases over the next 2 years. Someone must have gauged fan-reaction to the Clones figures, because by the time 2003 came around, much of the action features and added ‘oomph’ of the line had died away, and the figures began to return to their less ‘extreme’ poses. A downside to the first wave of figures, was that until the recent Vintage Collection did new sculpts of several characters from Attack of the Clones, a lot of what we had to hold onto were figures from this wave. Some figures were ‘corrected’ shortly after their 2002 incarnations (Padme, for example), while some like the young Boba Fett have never been recast.